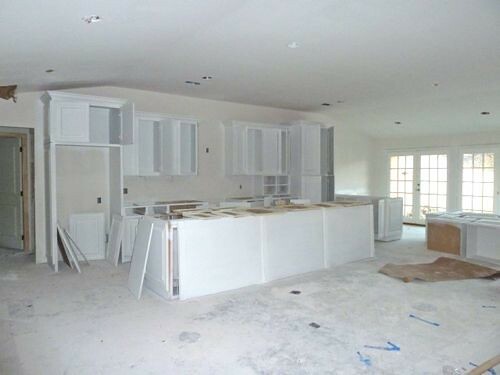 The kitchen cabinets . . . 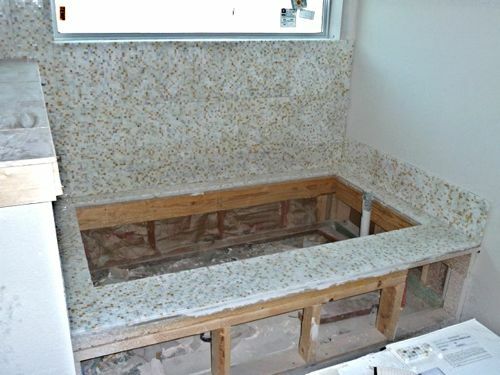 The shower in the jack ‘n jill bath . . .
. . . with an accent made out of the backsplash tile we had left over from the last flip. Let’s hope today brings just as much progress! Holy moly it’s so exciting I can barely stand it! Love that accent in the bathroom and so awesome that it’s with leftovers! Love it! And the tile around the master bath is to die for. The people who buy this house are so darn lucky!!! You’re making so much progress, and it’s so much fun to watch! It has to be so much fun for you (in addition to potentially being a little stressfull at times :-)). pk @ Room Remix´s last blog post post ..Giveaway! you wont want to miss this one! Isn’t it fun to watch the progress? I LOVE IT ALL! 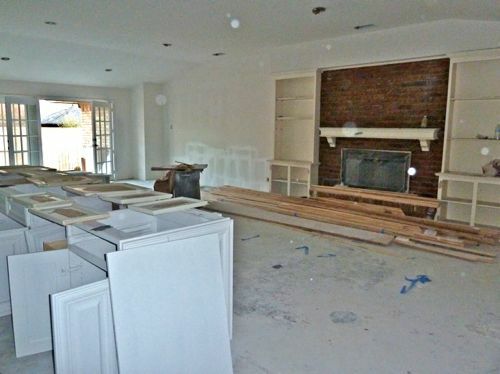 But my favorite is the fab transformation of the great room with the kitchen cabinets. 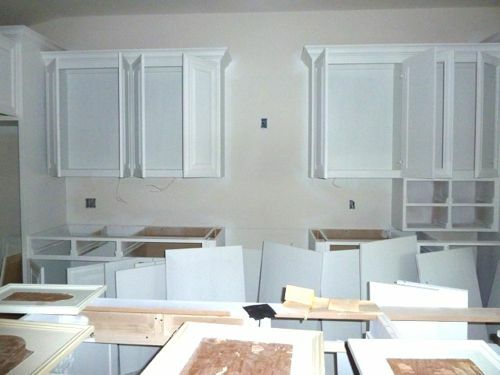 The cabinetry looks wonderful, and the room is evolving beautifully! 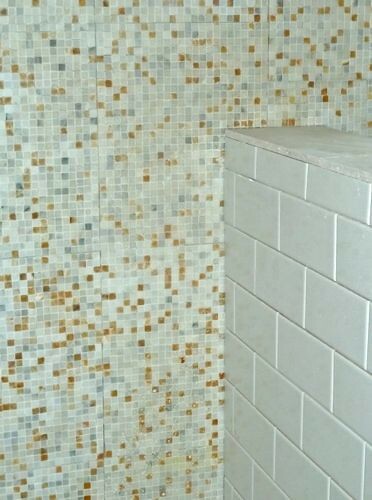 The mosaic tile in the bathroom is gorgeous! Gorgeous tile in the master bath. Looks like you’ve been busy! 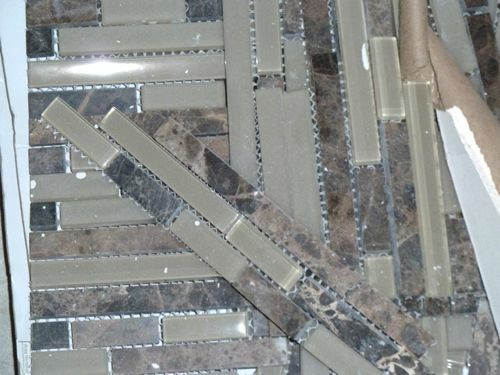 Your cabinets are going to look amazing. Can’t wait to see it all together It looks amazing already in the white photo. 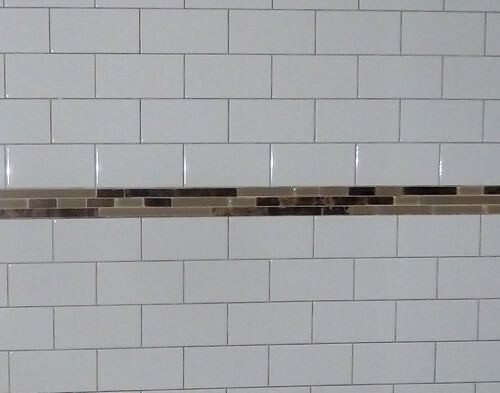 And, your tile? I’m dying over here. Need to see it all. It’s coming along so quickly. 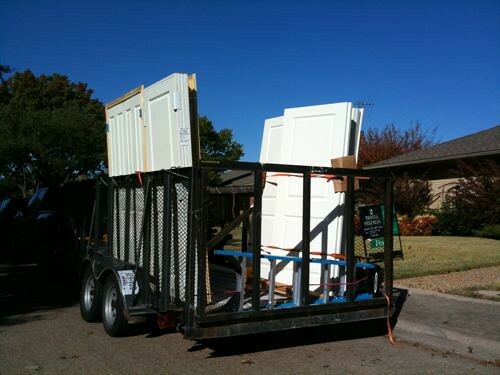 That’s the benefit of hiring contractors rather than doing things yourself. You are 100% correct. There are definitely some things we’ve hired people to do that we could either do or learn to do, but we decided that it would make more sense in our situation (i.e., flipping) to pay someone else to do it correctly and quickly rather than rack up months of interest payments, taxes, utilities and property insurance while we went through a serious learning curve. Not everyone would make the same decision, but it works for us and allows us to move onto the next project that much quicker! Your kitchen looks amazing. I would like to know what paint/tools you use for painting your kitchen cabinets. My husband and I are going to repaint our oak kitchen cabinets white and we’re not sure what to use. Any advice would be appreciated. Thanks! Thanks, Gosia! We hired professional painters to do this job, and I know they used a paint sprayer and oil-based semi-gloss paint. Before they sprayed they removed all of the cabinet doors and drawers so they could be sprayed separately from the cabinet frames. They also primed the cabinets before painting, which would be important in your case so that none of the wood grain bleeds through. I hope this helps! Liz – In the first picture it appears as though the painters started painting with some of the doors still attached. What did your hinges look like after they had painted? 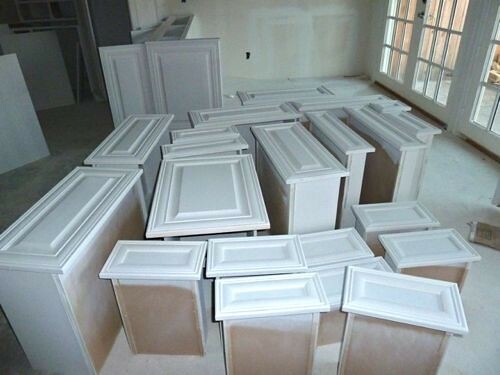 We are also planning on doing this to our cabinets. We have been practicing on doors and trim building up to the main event of the cabinets. Love what you did and so glad I found your blog . . . better late than never!